We are happy to announce that we have struck gold! Oops, not gold literally, but we are conducting an exhaustive 3-month long training program for the skilled professionals from Wells Fargo & Company, US. It’s a huge opportunity for us, as they have chosen us, out of our tailing contemporaries and hope we do fulfill their expectations! Wells Fargo & Company is a top notch US MNC in the field of financial service providers. Though headquartered in San Francisco, California and they have several branches throughout the country and abroad. They even have subsidiaries in India, which are functioning well alike. Currently, it is the second-largest bank in home mortgage servicing, deposits and debit cards in the US mainland. Their skilled professionals are adept enough to address complicated finance-induced issues, but they need to be well-trained on tackling Credit Risk Management challenges, as CRM is now the need of the hour. Our consultants are focused on imparting much in-demand skills on Credit Risk Modeling using SAS to the professionals for the next three months. The total course duration is of 96 hours and the sessions are being conducted online. “The training session starts from today, and will last for three-months. The total session will span over 96 hours. Reinforcing our competitive advantage in the process of development and condoning data analytics skills amongst the data-friendly communities across the globe, we are conducting the entire 3-month session online,” he further added. Credit Risk Management is crucial to survive in this competitive world. Businesses seek this comprehensive tool to measure risk and formulate the best strategy to be executed in future. Under the umbrella term CRM, Credit Risk Modeling is a robust framework suitable to measure risk associated with traditional crediting products, like credit score, financial letters of credit and etc. Excessive numbers of bad loans are plaguing the economy far and large, and in such situations, Credit Risk Modelling using SAS is the most coveted financial tool to possess to survive in these competitive times. 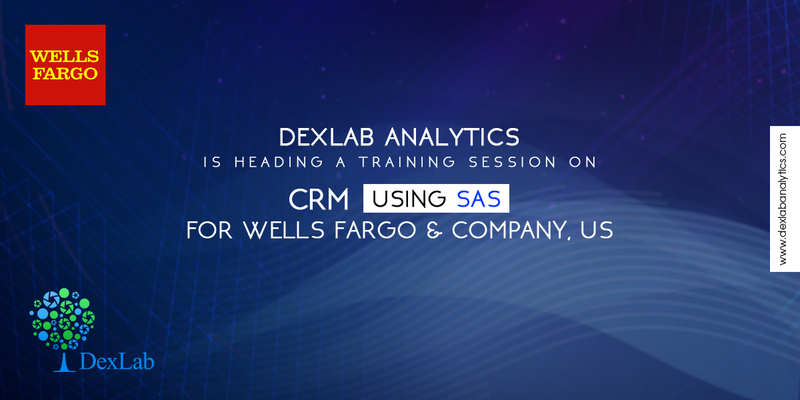 In the wake of this, DexLab Analytics is all geared up to train the Wells Fargo professionals in the in-demand skill of CRM using SAS to better manage financial and risk related challenges.